Biodiesel is a renewable, environment friendly substitute for petro-diesel fuel. It is produced from edible and non-edible oils and animal fats. Normally biodiesel blends can be used in diesel engines without any alteration. Seed contains 32-35 % Oil. Being rich in nitrogen, the seed cake is an excellent source of organic manure. Various parts of the plant have medicinal value. Can withstand poor quality of soil, sustain arid environment and grow in saline conditions. Can withstand severe heat. Likes heating and does well in warmer areas. Like all trees, Jatropha removes carbon from the atmosphere, stores it in the woody tissues and assists in the build up of soil carbon. It is thus environment friendly. From Some source it has been found that a Jatropha tree absorbs 8 kg of CO2 every year. It has the desired physio-chemical and performance characteristic comparable to petrodiesel. 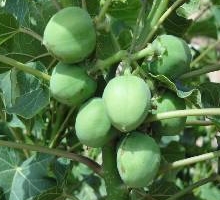 Jatropha oil has higher cetane number (51) compared to other oils, which is comparable to diesel (46 to 50) and makes it an ideal alternative fuel and requires no modification in the engine upto a certain mix ratio.